Sure, everyone knows that the Hamburger comes from Hamburg and the frankfurter comes from Frankfurt. What could be plainer? But it may interest you to know that while the meats themselves are German in origin, the idea of placing a Hamburger or a frankfurter in a bun is an American innovation and institution. The fact is those countries that do regularly consume the frank and the Hamburger are more likely to import them from the United States than Germany! The Hamburger is a more recent invention than the frankfurter. During the middle ages, traveling merchants from Hamburg learnt from the Tartars of the Baltic lands how to scrape raw meat and season it with salt, pepper, and onion juice for what came to be known as “Tartar Steak”. Many restaurants still serve a similar dish known as “steak tartare”. No one knows the name of the first cook to shape scraped or chopped beef into a patty and broil it, but we do know that the first Hamburgers were browned on the outside and almost raw inside. When the Hamburger arrived in America, it was eaten quite raw, the way the French, for instance, still prefer their meat. The English and Irish were the first to cook their beef patties well done throughout. The English called the burger Salisbury Steak after Dr. James H. Salisbury, who in the 1880s recommended to his patients that they eat well done beef patties three times daily, with hot water before and after, to relieve colitis, anemia, and other ailments. Modern doctors might scoff at Salisbury’s ideas. But you’ll find Salisbury Steak on many dinner menus side by side with the Hamburger. The difference? Well, many diners buy their chopped meat frozen in large plastic bags. To prepare Hamburger patties, an implement such as ice cream scoop is used to extract thawed meat from the bag and set it on pieces of wax paper. The chef then forms the patties by swatting the lumps of chopped meat with a heavy can of vegetables, round of course. For the Salisbury Steak, however, an oval can (usually a sardine can) is used to shape the meat. Burgers were first popularized in the US by German immigrants settling around Cincinnati. But the first Hamburger wasn’t laid between the halves of a bun until early this century. The sandwich, meat of any kind between pieces of bread, has been with us since the eighteenth century. The sandwich was reputedly the brainstorm of inveterate gambler John Montagu, fourth earl of Sandwich, who stuffed his meat between bread slices so that he could dine at the gambling table. Officially, the first Hamburger sandwich appeared at the 1904 Louisiana Purchase Exposition in St. Louis, Missouri, also the birthplace of the ice cream cone. As for the modern Hamburger, the last decade has seen a huge increase in burger corruption, with Soy protein being a common culprit. But consider yourself lucky. A Welsh zoologist has been working on a high-protein burger made from rat meat. And other scientists with tainted tastebuds have proposed a Hamburger made from cotton. Talk about flannel mouth. If the popularity of the frankfurter has tapered off somewhat in recent years, the Hamburger is certainly on the rise. Chopped meat now accounts for about 30 percent of all consumer meat sales. As late in the 1920s, many American dictionaries still did not have the word Hamburger, though most did mention the Hamburger steak. Today, it would be indeed hard to find a restaurant, diner, coffee shop, or road side stand that did not serve the Hamburger in some shape or form. Burger joints have been mushrooming all over Europe too, led by a British chain known as Wimpy’s. And you’ll have no trouble in Paris finding a McDonald’s for “Le Cheeseburger”. McDonald’s is a story in itself. A chain known as White Castle was the first to serve cheap, mass produced Hamburgers. Since then, Hamburger joints have proliferated. Today, McDonald’s is definitely the leader of the pack. Beginning with a stand in Des Plaines, Illinois, which raised its now famous yellow beams on April 15, 1955, McDonald’s has grown into a huge corporation with well over several billion dollars in annual sales. 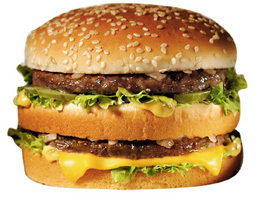 McDonald’s sales average a billion Hamburgers every year. To date, McDonald’s has sold over 100 billion Hamburgers. Stack them up, and you’d have 100 piles the height of the tallest buildings in the world. The McDonald’s Corporation is run from a complex near Chicago called “Hamburger Central”. Since 1968, new franchisers have been taught the ABC’s of hamburgerology at a school in Elk Grove Village, Illinois, known at Hamburger University. The McDonald’s philosophy in the 1970s, in 3 out of 4 families, it’s the children who decide where to eat. Please the child, and you’ve captured the entire family. That idea has certainly worked. The McDonald’s burger has not only spread from coast to coast in the US, it has multiplied globally. 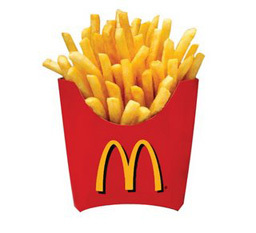 As of 2007, there were more than 31,000 McDonald’s restaurants throughout the world. And yes, there’s a McDonald’s in Hamburg. If the McDonald’s burger has lost little in translation, some of the firm’s terminology has not fared so well. When McDonald’s was laying plans for its first Paris franchise, “Gros Mec” seemed the appropriate translation for the Big Mac, until red-faced McDonald’s officials learned that “Gros Mec” also meant “big pimp” to the Frenchman. McDonald’s may hold the record for the number of Hamburgers sold, but certainly not for the largest burger. That honor belongs to a group of Australians who in 1975 exhibited a 2,859 pound Hamburger which was over 17 feet in circumference. Hopefully, they had a few tons of catsup on hand.